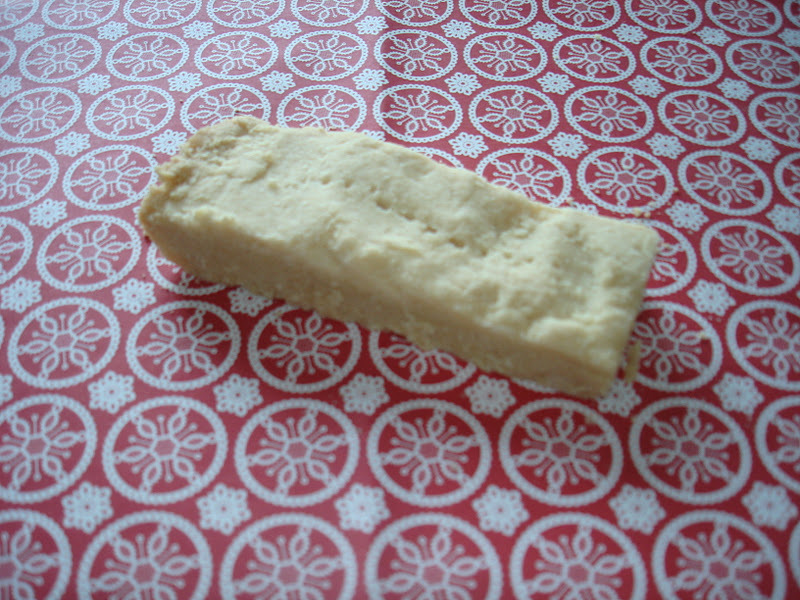 I've been working all week on tweaking the shortbread cookie recipe that fell a bit short last week in my shortbread taste test. Click HERE to see the results of a taste test between 4 kinds of gluten free shortbread cookies. I wanted to have an original recipe to pass down to my son, so that he can enjoy shortbread during the holidays the way I did growing up. I think I've succeeded! The batch I made last night is almost gone, and I've only had one (maybe two). 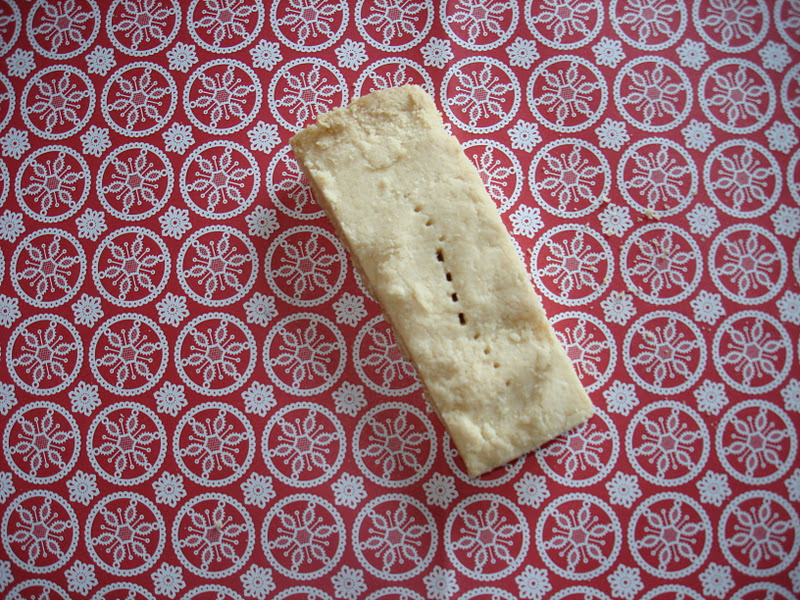 This recipe makes a traditional, flaky shortbread with a hint of vanilla flavour. I know that it's a keeper because I have been thinking all night about variations I can do with this recipe. For me, I'll use this as the basic recipe that can be modified to make a variety of different shortbread cookies. This recipe makes approx. 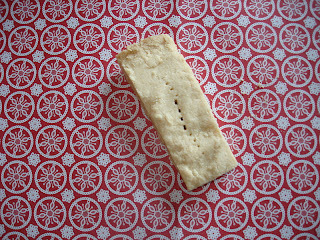 12 shortbread bars about 1/4-1/2 inch thick, or about 24 thinner cookies. Preheat oven to 300F. I use an 8x8 non-stick brownie pan with edges. My mom uses a cake pan. 1- Mix rice flour, all-purpose flour, cornstarch, baking powder and xanthan gum in a bowl. Stir until completely mixed. 2- In a separate mixing bowl, cream butter, sugar and vanilla (and salt, if adding). 3- Add dry mix to butter and sugar in small batches, mixing as you go. Mix until completely incorporated. It should form a ball if pressed together, but it won't automatically make a dough while mixing. 4- Gather into a ball, kneading just long enough for the dough to stick together. Press dough into baking pan until it is evenly distributed and pushed right into the sides. 5- Cut into desired bar sizes, and prick holes into each bar with a fork. Chill for 10 minutes before placing in oven to bake. * See below for cookie cutter instructions. 6- Place into preheated oven uncovered. Bake for 35-40 minutes, or until edges are golden and cookies are cooked through. 7- Remove from oven and place on a wire rack to cool. Run a knife along pre-cut edges and then allow to cool completely before removing from pan. *If making cookies with a cookie cutter, place dough on a sheet of parchment paper and cover with plastic wrap. Roll out dough and use cookie cutters to create desired shapes. Place cookies on a cookie sheet, and check cookies after 25-30 minutes. If you want them a little less dry, they could probably handle up to another 1/4 cup of butter. I like mine borderline dry but not crumbly, so 3/4 cup works for me. My husband and son have been gobbling these up all day. I'm looking forward to trying these out in different incarnations- adding cinnamon instead of vanilla, maybe some cocoa powder, or cranberries and orange....mmmmm. I've always loved holiday baking, and now I can love doing it gluten free!